"Not knowing how to do something should never be a reason for not doing it." "Many times people are so concerned with their image that they are too afraid to help." 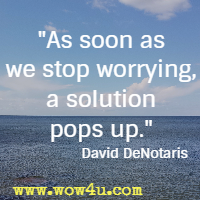 "As soon as we stop worrying, a solution pops up. " "If we put our energy in worrying, that is what we will harvest." Nothing feels as good as when you are with family or old friends, laughing about old times and making new memories to laugh about in the future. People have asked me to "prove there is a supernatural God." My response is "prove to me there isn't." When we walk by faith, we see things we never could imagine. "Harmony is something we must have with others, but it must start inside us first." "We have the ability to decide what thoughts we are going to dwell on." "..the H.A.L.T. method. Never make a decision when you are Hungry, Angry, Lonely, or Tired." "Our motions can change our moods and can even change our minds." Anyone can speak words, and anyone can think they love someone. But it is the love of someone who stays with you, the love of someone who believes in you, that is the true definition of love. Faith is the most important key to all successes. I have read hundreds of books, journals, and magazines; attended hundreds of seminars; and listened to thousands of hours of tapes and speakers. The common thread that links them all is a theory from the Bible, and that is faith. "It's the little things that we remember that let people know we care." "..I ask people if an elephant has ever bitten them. Most of the time people say no. But everyone has been bitten by a mosquito. It's the little things that get us." We can sit around and wonder why some things happen, why people say what they say, but we must have a light heart and learn to laugh at ourselves and at crazy situations." I was told that blindness would beat me or that I would beat it - the choice was mine. Now, some twenty-six years later, I realize that everyone has problems and crosses to be. "Whatever the problem we have in our life, someone has faced it and overcome it. " We must have a positive attitude, we must believe in what we are doing, and we must think about other people as our customers. Life is a two-way street, not just a one-way street. We must think about other people and about how they will benefit from what we are offering. When we try to change ourselves because we think someone else will like us more, we just fool ourselves. When we are true to ourselves, we feel free, liberated from the changes of doubt and fear. We must be true to ourselves, and peace will flow. Our imagination is the workshop of the mind. This is the place where dreams are born, ideas are nourished, and plans are made. Harmony is like singing angels; life is sweet, peaceful, and fulfilling. Let's get harmony on the inside, and we will positively change our worlds on the outside! I have found that some of my best decisions, plans, and thoughts have come to me while I was praying, mediating, or just thinking on the treadmill. It is simply amazing when we get in motion how we can clear our brains and allow positive, healthy, thoughts to drop from heaven into our lives. There is so much wisdom in these quotes from David. One of our favorite quotes by David DeNotaris is: "Not knowing how to do something should never be a reason for not doing it." There is no reason for not being able to do something because we don't know how to do it. With the internet you can research anything and find information and many times you can also find find videos that will show you how to do it. And, if you don't have access to the internet there is always the library. The library is full of books that contain information and knowledge that you can learn from. But, if you don't have access to the library there are always other people you can turn to. The majority of people enjoy sharing their knowledge with others, but you have to ask. As David said in his quote, "Whatever the problem we have in our life, someone has faced it and overcome it. " There are always people who have gone through exactly what you are facing. Ask them and you will find people will be glad to help you! Truly wise words from David.